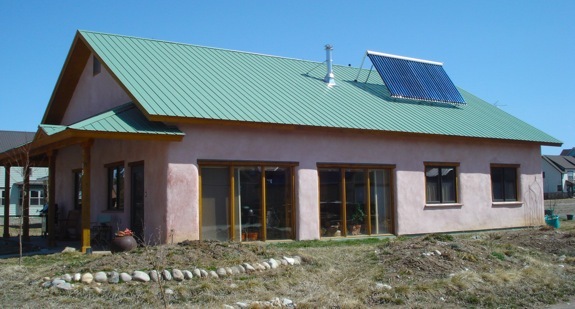 Gunnison, Colorado, ranks within the top 5 cities with the average coldest temperatures in the United States, yet the insulating properties of the straw bales make this an efficient and comfortable passive solar home. An amazing aspect of this house is that it is made primarily from all natural materials: straw, wood and various mixtures of adobe mud, including mud-plaster, cob (free form clay with straw) and adobe bricks. This passive solar house was built out of straw bales. While Gunnison typically has frigid below-zero temperatures in the winter, it also has over 300+ sunny days out of the year, making a passive solar design ideal. This passive solar straw bale home radiates a quiet warmth, while its thick walls give a sense of strength and security. The absence of the fans and motors associated with forced air heating create a quiet atmosphere as the floors radiate heat. Even on a cloudy day, the straw bale home was comfortable and warm. The house is an Energy Star home rated soon after it was built and has a home Energy Rating System (HERS) ranking of 33. Even while living in one of the coldest areas in the nation, for the past two years of living in the home, the owner has spent approximately $500 dollars per year on both electricity and gas. The house was built over one long summer (and the summers in Gunnison are indeed quite short) with the help of the community on the straw bale fill-in day. Straw bales were used to fill in the house after it was framed and roofed. Picture courtesy of Dusty Szymanksi from Straw and Timber Craftsmen. There are many benefits to building with straw bales. 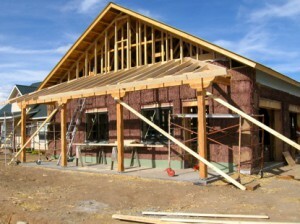 Straw bale walls can have an R-value that ranges from R 30 – 45 after they have been plastered and finished. A straw bale wall that has the typical three coats of plaster also has a strong resistance to fire as well as bugs. I’ve been told that burning a hay bale wall is like trying to burn a phone book. Because they are covered with plaster, thick and tightly packed, the wall lacks oxygen to easily burn. During the building process, however, extreme care must be taken because loose straw can be highly combustible. It would be a very bad idea to have smokers as construction workers on a straw bale build. Notice all the straw left on the ground during the fill-in process. Care must be taken to quickly clean up all loose straw around the building site. 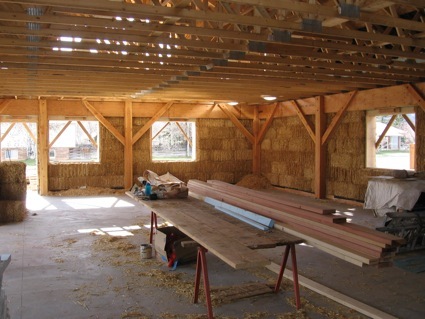 The beams that are the frame of the house can be seen between the straw bales. Photo Credit – Dusty Szymanksi from Straw and Timber Craftsmen. 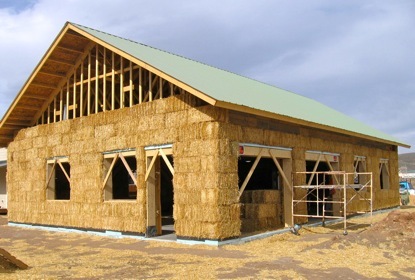 Straw bale buildings are typically built in one of two ways, either with the straw bale walls being load bearing or non load bearing with a traditional stick frame, with the straw bales filled in. 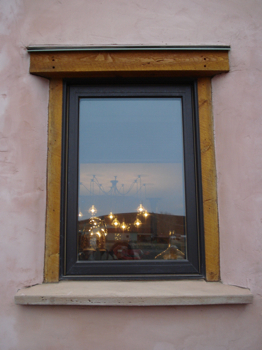 This straw bale house was timber framed and mechanically bolted. After the house was framed, the roof trusses went on top of them, then it was roofed before the straw bales were filled in. In this way, the straw bales were protected and kept dry by the roof during the building process. When used for building, straw bales must be tightly packed and kept dry. Dusty Szymanksi. When the day came to put the straw bales in, about 35 people from the community came to help in the process. 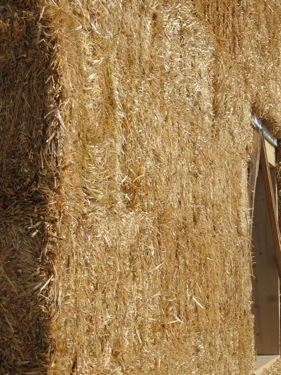 Another advantage of building with straw bales is that they are a renewable and a very sustainable source for building. Straw is a byproduct of growing grains. It is left in the field after the tops of the grains have been harvested then typically burned in order to get rid of the extra waste. It is a material that is readily available in many parts of the world. See a strawbale house built in Haiti after the earthquake. Straw bales used for building should be free of grains, clean, kept dry and tightly packed. There are special building and design considerations that must be taken into account when using straw bale. Keeping this in mind, local climate considerations were taken into account within the design of the house to better protect the straw bale walls. The porch in the front of the house faces the west, where in Gunnison, the weather and driving wind usually come from. The extended roof built over the porch helps to protect the bales from moisture that the weather brings. After the straw bales are stacked to create the outer and inner walls of the house, a slip coat of adobe mud is placed over the straw. All horizontal surfaces in a straw bale house must protected against the threat of standing water. From outside to inside, there is a one inch layer of clay that has been covered with lime (to render it semi-impermeable from water). The outer inch of clay meets the 18 inch thick straw bale, which is covered by an inch of clay that is finished with plaster. Now we are inside the house. There is typically no vapor barrier on vertical layers as the clay coating on the straw bale absorbs and releases water to regulate the humidity in the building. In a straw bale house, a horizontal surfaces must be protected to keep moisture out. All the window bucks must have a water impermeable surface to keep standing water from seeping in. Fueling my fascination with efficient homes, I admit it, I’ve been taking various building classes. During one class, the class had the opportunity to tour this straw bale house. On this day, sun shine was mixed with clouds, making an overcast, rainy evening, yet the house was quietly radiating warmth. In order to contact someone on a specific build, I’d suggest going to the build site and seeing if you can talk to someone. Keep in mind that building a passive solar home in a warm, tropical climate will have slightly different concerns and issues than a lot of the homes that you see in greenpassivesolar.com. I’ll be heading to the Solar Decathlon next week to see the newest and latest in solar design where two Florida university teams are building houses for the competition. Check their homes: The Flex House and The PerformDance House. There’s also an article about strawbale homes in Haiti and the rebuilding process occurring after the earthquake. FYI, a TV show, Building Green was created by PBS. There is a 3 disc set of the entire season and the construction techniques in some detail. I am pretty sure you can find a set on Amazon or Ebay. And I have just discovered that all episodes are available on YouTube for free.That would be a good place to start. I am sure the host will be happy to speak to you. He is an environmentally aware contractor who built his own home for the show. His name is Kevin Contreras. He is located in southern California. I used this series to teach Environmental Engineering principles. I live in Australia. Is anyone on this continent doing this kind of thing. Is it expensive to build because of the unconventional methods?